As you age, the lens of your eye gradually becomes cloudy. We call a cloudy lens a cataract. The word cataract comes from an old Latin word for waterfall. Waterfalls produce heavy mist that can blur your vision. Cataracts have the same effect—blurry vision. Looking through a cloudy lens is like looking through a dirty window—everything is blurred. Lift the fog – clear the blur. Everyone who lives into their 60s develops at least mild cataracts. 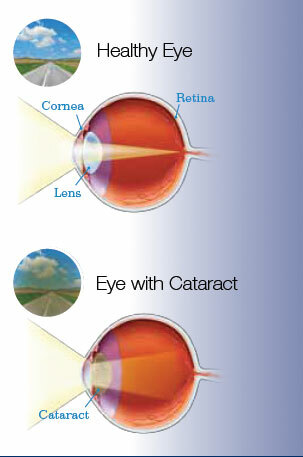 Early on, the cataract process not only makes your lens cloudy, it also makes your lens swell a little bit. When your lens gets bigger, you become a little more near-sighted. Regularly scheduled eye exams can keep you ahead of the cataract development, in the early stages of the cataract, simply changing your glasses prescription will usually restore your sight. However, as you continue to get older the cataract gets more and more cloudy, and eventually not even a change in your glasses prescription will improve your sight. At that point, the only way to restore your vision is to remove the cataract with eye surgery. Without cataract surgery, as your vision declines, you’re likely to reduce your day-to-day activities – you’ll go fewer places, see fewer people and do less and less. These changes can impact your health by restricting your activities and decreasing your ability to enjoy life. Cataract surgery may help prevent these changes. If your cataracts are making it difficult for you to participate in normal activities such as reading, working, driving and other things that are important to you – then it may be time for you and your doctor to discuss your cataract surgery options. Cataract surgery has been shown to reduce stress and anxiety and decrease risks of falling and getting into car accidents. Successful cataract surgery can also make it easier to read, increase social activity and improve overall quality of life. And that’s just with standard replacement lenses. Left untreated, cataracts have the potential to cause a complete loss of vision. Thankfully, treating cataracts now involves a safe, relatively simple surgery – an amazing procedure that can literally change the way you see the world. Doctor Frangie is pleased to be able to offer his patients a number of choices for their implants, in an attempt to decrease dependence on spectacles and/or contact lenses, depending upon the specific characteristics of your eye. 1) SINGLE FOCUS IOL (INTRAOCULAR LENS IMPLANT) – This implant is considered the “standard” implant and its design has not significantly changed in more than a decade. Following placement, the Single Focus Implant will allow the eye to see at a single focal point (most patients see better at distance), but in order to see at intermediate (computer distance) or up close (for instance sewing or reading) the eye will require either a contact lens or glasses. 2) ASTIGMATISM-CORRECTING IOL IMPLANTS AND SURGERY – Astigmatism is typically a lifelong condition where the cornea, the outer window of the eye, has an irregular shape which prevents light from focusing accurately on the retina – even after standard cataract surgery. In patients who are candidates, astigmatism may be corrected by either specific wound construction or a Toric lens implant or both. Rarely, some patients may require an adjustment of their implant or even more rarely another procedure such as Lasik to improve their final visual outcome. If further procedures to adjust/exchange your implant or procedure to fine tune your vision are necessary, they will be done at no additional charge to you. Lift the fog – clear the blur. It is important to understand that while Astigmatism-Correcting Surgery will improve your uncorrected distance vision (and in some cases your intermediate distance vision) you will still need reading glasses for tasks that are close – sewing, reading, model-building, etc. If you will only be happy with “perfect” vision, the astigmatism correcting procedure may not be for you. 3) MULTIFOCAL IOL IMPLANTS represent a major advancement in cataract vision correction. These lenses give recipients an enhanced “range” of vision so they have reduced dependency on contact lenses or glasses at almost all distances. While these technologies represent a definite improvement, it is important to realize that the implants will not give one’s eye the performance level of a normal twenty year-old eye – the implants represent an improvement, not the fountain of youth! This new generation of implants typically allows patients to drive without correction, play golf without correction, use the computer without correction and reduce the need for reading glasses. Cataracts generally develop slowly and painlessly. In fact, you may not even realize that your vision is changing. Still, cataracts are the most common cause of vision loss in people 55 and over – sooner or later, you’re bound to experience one or more of the following symptoms.